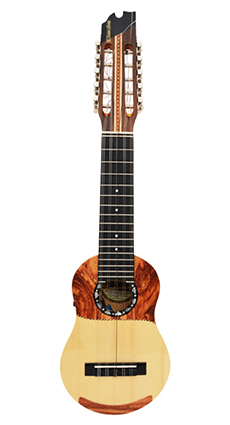 The charango is an instrument born in America, derived from the Vihuela. It was very widespread in Bolivia and Peru. It is a cordófono, pertaining to the group of the compounds in which the portacuerdas and the box can not be separated without destroying the instrument. Originally it was made with different types of armadillo shells. Also known as quirquincho. Nowadays it is mostly built in wood to give a better resonance and avoid the extinction of Quirquincho. It has ten plastic strings grouped in five pairs with the following notes (from bottom to top): MI · LA · MI (a the lower octave) · DO · SOL."